A large bounty is put out on Supergirl and aliens from far and near attack National City intent on taking out the woman of steel; Alex and Maggie run into Maggie's ex-girlfriend, Emily, who is in town for a week; Hank gets an interesting order from President Marsdin. *Den of Geek review - The Mon-El arc comes to a climax in "Distant Sun," a family drama with one of Supergirl's scariest villain yet. 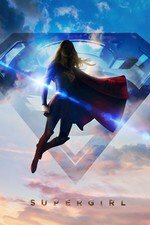 *IGN review - The whole galaxy is after Supergirl. I liked this episode 100x better than the last one Kevin Smith directed. Terri Hatcher makes a very effective villain. Mon-El was marginally less annoying than in previous episodes, but he is still unworthy of Kara. It's so egregious that to justify Kara's ongoing devotion to Mon-El I have had to fanwank a scenario in my head where Mon-El is the greatest lover in the galaxy and Kara is enjoying super-Os in the bedroom. So super she is willing to overlook Mon-El's deficiencies in every other department. I'm beginning to think that the whole Maggie and Alex storyline in S2 is to convince everyone that lesbians invented healthy relationships, amiright? I miss James. Mehcad Brooks is being wasted and if I was him I would be so p*ssed about being sidelined this season. I am so tired of watching The Mon-El Show, I want SUPERGIRL back!!!! yes I continue to watch for Alex and Maggie. I teared up when Alex was all like "I got u, girl, let ur guard down". On a notion, I Googled to see if Melissa Benoist happened to be dating the actor playing Mon-El. A _lot_ of the casting of this show seems to be sentimental, even conceived specifically to accommodate certain actors who have a history in "superhero shows" or performing with the lead actors (see: the recent Glee reunion show). And here we are. This is show seems to not be primarily concerned with artistic integrity or cultural ideas. ...which is fine, not every show has to be about that, but it's a bit of a let down for this specific show, I guess. Not much to say about this episode that hasn't already been said. I did get a little laugh out of Winn's line delivery of "You watched Star Wars." Though maybe Kara's reaction to seeing her little hologram self was the most adorable moment of the episode. This is the episode that Mon-el won me over. right up until I stopped to think about how little he has done to earn anyone's admiration. Like, nothing. At all. Like remember the red kryptonite thing last season? Kara had to literally punch a helicopter out of the sky to win back people's trust. So I don't admire Mon-el. And I still think it was a heinously bad choice to let him push James out of the show. But he's so goddamn cute and Kara's sad-face was so compelling that I am finally, at long last, won over. Alex tracking down Maggie's ex at the hotel was so extra and yet so very her, I totally believed that Alex would do that. The cuter they are, the more careful you have to be. I'm behind on watching all this, mostly because I'm wondering if I should still be watching at all. I will say that if not for the treatment Mehcad Brooks has received here - Jimmy's romantic subplot dropped unceremoniously and his character basically now reduced to a guest star - I'd finally be okay with Mon-El's arc at this point. He isn't good enough for Kara, but at this point he seems to see that and is making a positive effort to fix it. I liked the scene where he's cooking and cleaning and doesn't try to stop Supergirl from going to fight without him. It's a good message to have, and really appropriate in a show like this. But *with* the Jimmy stuff, I'm still very unhappy with them. amtho's Googling was clever and just makes me more frustrated about the whole deal. * Winn and Mon-El are actually fun together. I liked their brief interaction, and I would probably watch their show too. * Maggie/Alex is still great. Ah, well. Guess I'm still following this for the time being.